Distance from the Liberty Stadium: 186 miles ~ 3 hours 6 minutes. Swans fans are in the Brook Road Stand, the opposite end of the ground to where the Jack Army was on our last visit in 2006. Up to 600 seats are available upstairs, with terracing available below for away fans if required. The food on offer is the standard football fare of pies, burgers, pasties, hot dogs and sausage rolls. Brentford is close enough to do a day trip straight up the M4 and back, but there’s also the option of staying over, especially being so near to central London. If you plan on making a weekend of it for seeing the famous nearby landmarks, such as The London Eye, Buckingham Palace, Tower Bridge, Ben Big, the Houses of Parliament or just fancy a pre-Christmas shopping spree, then there is, as you’d imagine plenty of hotels available to suit all budgets. There is also the Premier Inn London Brentford (TW8 9AD) and Travelodge London Kew Bridge (TW8 0BD), both 0.4 miles away, Premier Inn Kew Bridge (TW8 0BB), Urban Villa (TW8 0FL), Hotel Novotel London Brentford (TW8 0GP), all 0.3 miles away. Plus of course there’s also the option of staying in central London. Aside from the main London attractions, there are also many free events on in the capital. The British Museum (WC1B 3DG) has numerous exhibitions. Changing the Guard takes place outside Buckingham Palace from 10.45am and lasts around 45 minutes, with the actual handover taking place at 11am. Hyde Park has a Winter Wonderland. There’s original artworks and props from the Harry Potter and Fantastic Beasts movies in an exhibition at House of MinaLima (W1D 5DE). The Royal Air Force Museum (NW9 5LL) is dedicated to the RAF, hours can be spent there. The National Portrait Gallery (WC2H 0HE) has the world’s largest collection of personalities and faces, from the late Middle Ages to the present day. The Natural History Museum (SW7 5BD) in Kensington is dedicate to everything from flowers to whales. The Faraday Museum at the Royal Institution (W1S 4BS) has been home to 14 Nobel prizewinners, and housed the laboratories of some of the world’s greatest scientific people. It uses animations and comedy to explain some of the concepts and equipment on show. Brentford has a pub on each corner of the ground; they are The Griffin (TW8 0NP), Royal Oak (TW8 0NU), The Princess Royal (TW8 0LF) and The New Inn (TW8 0NX). My favourite is The Griffin, a great pub with Happy Valley Chinese takeaway opposite which is open from noon. Real ale drinkers could try The Magpie & Crown (TW8 8EW), a 0.6 mile, 10 minute walk from the ground on Brentford High Street. The pub has four real ales on tap and is welcoming to home and away fans. 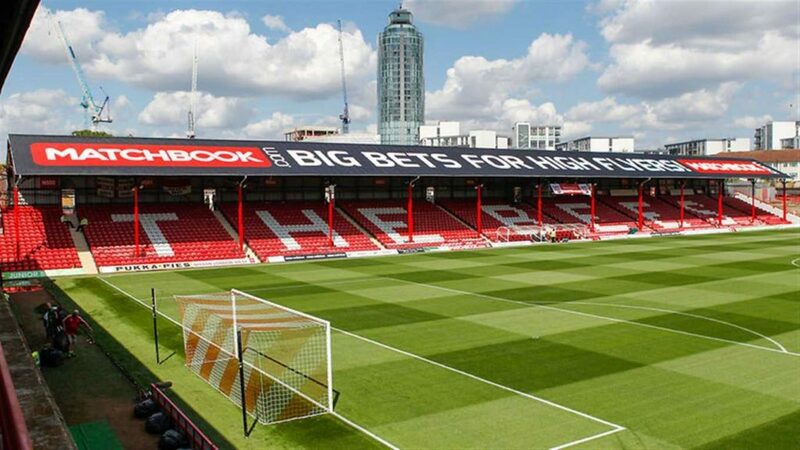 Street parking is available near the ground but you can also choose from a selection of private car parking spaces near Griffin Park – including around 49 reservable parking spaces from just £7.00 for the day. The nearest train station is 0.4 miles away at Brentford, a five minute walk away. This station is on the London Waterloo to Reading line, running every 15 minutes. The nearest tube station is South Ealing, on the Piccadilly Line. This is a 15 minute, 1.1 mile walk away down Ealing Road. Bus number 65 runs from the other side of Ealing Road to the ground. Trains from Swansea leave at 06:59, 07:29, 07:59 and 08:29 for the 4 hour journey (changing at Reading and Feltham). Trains back are at 17:23, 17:53, 18:23 and 19:23, with a 30 minute wait at Reading.